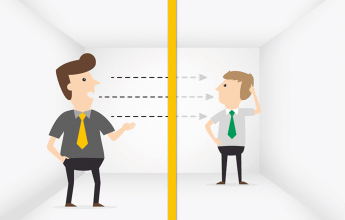 Why should you use acoustic fabrics? What determines the price of an acoustic drape? Acoustic fabrics are designed to improve sound conditions in architectural environments. From ensuring focus & silence to enhancing speech intelligibility, every problem has its own solution. 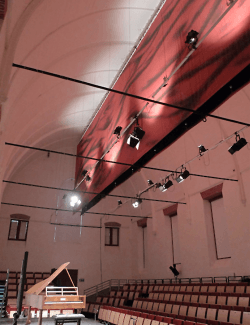 They are used in all types of settings including performance spaces such as theatres, concert halls, auditoriums, recording studios and rehearsal spaces. Or in venues such as public spaces, offices, museums, schools, gyms and swimming pools. Our acoustic engineers are constantly putting our textiles to the test to offer you the ultimate noise controlling solution. Noise standards and regulations concerning maximum noise levels make optimal sound quality more important than ever before. Acoustics solutions are an important consideration in the design, operation and construction of all buildings and can improve acoustic conditions. They ensure a healthy auditive environment and are a counter measure for health problems, bad communication and slacking productivity. Curtains and fabric panels are easily adjusted, relatively economical and often an integral design element. Easily restore focus, silence and speech intelligibility in any space by choosing the right acoustic enhancements. 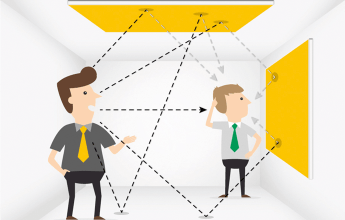 The difference between sound absorption and sound insulation, explained in 60 seconds. Spaces that create an echo or which are noisy even when very little sound is being made, need sound-absorbing materials. These focus on sound problems occurring inside a space that is probably large, open or that has many hard surfaces reflecting the sound. Sound-absorbing curtains and panels primarily deal with the shortening of reverberation times, improving speech intelligibility and decreasing background noise. ShowTex acoustic materials are ideal for absorbing and controlling sound waves. Want to improve sound quality and reduce reverberation levels within a venue? Discover our sound absorbing products. Where sound absorption focuses on how sound behaves inside a single room, sound insulation deals with problems occurring between several spaces or buildings. ShowTex offers acoustic solutions that reduce the transmission of sound from one area to another. Combining either sound-absorbing and/or sound-reflective fabrics will improve the degree of speech privacy or reduce unwanted noises from within or outside a room. Scenic fabrics with a netted structure can be used to mask speakers or other audio installations without changing the sound characteristics. ShowTex even offers a unique acoustically transparent velvet which lets sound through perfectly: Velours Transsonic (or view our full range of sound-transparent products). Curtains, fabric panels and acoustic baffles are easily adjusted, relatively economical and often an integral design element of a space. Use them in offices, museums, schools and auditoriums or in venues ranging from theatres and recording studios to dance, drama and music rehearsal rooms. Made to measure drapes allow for modular designs, multi-functional solutions and a wide choice of products. A system of acoustic curtains can be the solution to rearrange your venue while allowing for endless possibilities in terms of functionality and appearance. Simply open and close the drapes and transform any space within a few seconds! Need inspiration? Check out this office space which uses our system to quickly transform the "rooms". Acoustic panels are available in standard or custom solutions and ensure a high level of performance. They are the ideal choice for controlling the reverberation time in any space that is in need of better acoustics. With an exceptional sound absorption coefficient of 1.00 they eliminate most of the early and late reflections with just a few ceiling or wall panels in proportion to the room’s total surface and volume. Combine with LED lights to give your panels an extra dimension! As functionality and aesthetics go hand in hand, custom-printed acoustic drapes or panels can provide a practical solution while adding a unique vibe to your space. Customise any multi-layered acoustic curtain with a print that fits your taste, print a sound-transparent fabric to mask speakers and other audio installations in a creative way or incorporate your artwork in an acoustic wall covering that will instantly increase the level of sound absorption in your room. Increase sound absorption and aesthetic appeal of your space, ensuring comfort and reliability whilst meeting regulatory requirements, acoustic performance and architectural criteria. Fabric wall upholstery is custom built on scene and gives total freedom of design. A perfect fit for a creative mind. Made-to-measure designs, heavy-duty or light weight tracks, automated or manual controlled, we provide our customers with high-end technical solutions. Every acoustic curtain is different and needs to be fully adapted to the acoustic requirements of your venue. Let's take a closer look at the main factors which greatly influence the pricing of any acoustic solution. From extra-thick and luxuriously looking new velvet drapes over multi-layered curtains to budget-friendly Molton. The type of fabric will have an effect on the eventual cost. Luckily there's an acoustic material available for every budget. The key is to find the right balance between the desired acoustic result and the best-suited material for your budget. The fabric width in relation to the final curtain size and the desired finishing of the drape both influence the price of your acoustic solution. Acoustic materials come in a wide range of standard colours. More personalised options like custom-dyed fabrics and digitally printed drapes are also possible but usually come at an additional cost. 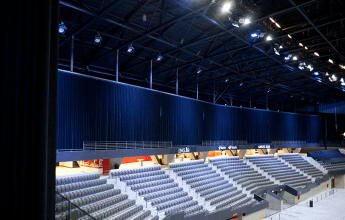 Depending on the weight of the curtain and the desired movement of the drape, a specific frame, curtain rail or track system will best suit your acoustic solution. 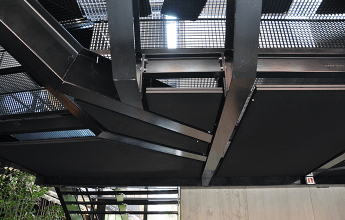 There are elegant and lightweight rails for interior purposes, but also large and heavy-duty tracks, either manually operated or motorised; the suspension options and associated budgets are very diverse. Our experts are ready to discuss the acoustic possibilities for your project. Always keeping the budget in mind. Want to meet? Get in touch! Today’s businesses are dynamic, impulsive and constantly changing. 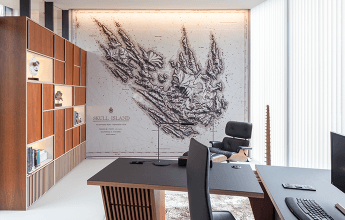 Office spaces must therefore be flexible enough to respond to these organisational changes and to the need for personal comfort and technological development. A system of acoustic curtains can be the solution to rearrange offices while allowing for endless possibilities in terms of functionality and appearance.